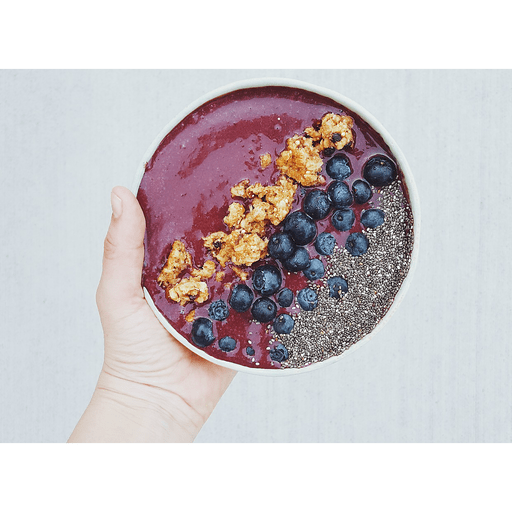 Trendy acai bowls feature antioxidant-packed acai berry puree, which lends a rich, dark chocolate flavor to the bowls. Acai bowls look and almost taste like ice cream, but they measure much higher when it comes to nutrition. 1. Place all ingredients into a blender and blend until smooth, adding more or less milk to achieve desired thickness. 1. Top with toppings of choice. Top with fresh fruit, granola, nuts, chia seeds, coconut flakes and chocolate chips. Calories 460, Total Fat 27g (Saturated 5g, Trans 0g), Cholesterol 0mg, Sodium 40mg, Total Carbohydrate 53g (Dietary Fiber 14g, Sugars 26g), Protein 7g, Vitamin A 35%, Vitamin C 60%, Calcium 15%, Iron 20% *Nutritional values are an approximation. Actual nutritional values may vary due to preparation techniques, variations related to suppliers, regional and seasonal differences, or rounding.